On Saturday I was invited to the HOLI ONE colour festival in Plymouth,the very first of its kind to hit UK cities. I blogged all about what the HOLI ONE colour festival is last week which you can read here. The weather forecast was set to be thundery which I was praying was wrong because powder and water basically becomes paint,which I was to find out later.. However, the weather could not have been more perfect,in fact it was maybe too hot but it was ideal weather for a festival like this. I can also officially say I am no longer a festival virgin too! The festival started at 12pm. But in true style my friend Laura and I turned up fashionably late around 1ish, there was already a good gathering of people there. The idea is to turn up as a blank canvas wearing all white to then be covered in a multitude of bright colours. I love the concept that everyone wears the same colour, however it meant about half the girls at the festival had the same idea as me as buying a £5 dress from primark! I didnt mind as by the end of the day everyone was a different colour anyway! I also wore a primark floral crown and juju jelly shoes. Mandatory picture by the HOLI one sign by the entrance! At the entrance I was greeted by the lovely Zoe who was waiting for those on the guest list. We were offered that we could go back stage at some point but I never got an opportunity to do so unfortunately but i still got some great shots from the day of the main event! I love how everyone wears white to the festival, I saw all sorts of interesting outfits. I particularly liked the people wearing white boiler suits! A lot of people also had water pistols but filled with watered down powder, every now and then you would get a sudden unexpected squirt at your back! The event was held at a place called Newnham park in Plympton and as we arrived there were already a lot of people gathering around on the grass or dancing. Throughout the event there was a mixture of DJ’s, singers and even a dance group. A festival doesn’t seem to be a festival without alcohol! As I cant drink I was happy to see that they even catered for people like me with mocktails. We also had to buy the powder, an individual bag was £2.50 but it worked out a lot cheaper to buy 5 bags and a wristband for £10. I can see how easy it can be to spend a lot of money at a festival. Every hour from 2pm there would be a count down on the stage and everyone would chuck their chosen coloured powder of choice. I took a video of it happening which was such an amazing sight,you can watch that here. A lot of people were wearing face masks or goggles which I wish I had brought as it really did not taste nice! It does feel quite suffocating when you are in the midst of it, but its a great atmosphere. I turned into a purple person after the first powder throw! We then headed over to get our faces painted. We queued TWO hours for this I kid you not. It was blazing sunshine by this point, and of course I forget to pack some SPF,rookie mistake. Anyway, it was worth the wait and it looked so pretty afterwards,I couldnt believe we didn’t even have to pay for it! We also missed two of the powder throws but there would be another 7 to go so it wasn’t the end of the world! It was then time for a good old whippy ice cream with a flake of course! We then prepared our next lot of powder for another colour throw! Photo credit to Paige Nolan. This is such a fab picture of the colour being thrown, those who had brought their DSLR cameras had covered them in plastic which was a brilliant idea to keep their cameras safe. I love professional pictures from the event, as you all probably do too but I like to use the majority of my own photography on my blog for many reasons mostly because I know its mine, however limiting in some instances. This was probably one of the best images I got from the colour throw. I could have got a lot closer shots but I was so worried about damaging my camera during it. I loved the amalgamation of the 5 different colours of powder,it really is such a cool thing to watch and partake in. As you can see it does get incredibly smoky and well,powdery! So this is how we looked as we left the event..Surprisngly not as covered as most people!We then left the festival around 7pm,it went on until 10pm but it had been a long and tiring day. The decision was made after a group of boys randomly decided to cover Lauras face and my hair in yellow paint!! I could have died when i thought the massive clump in my hair was chewing gum, luckily it wasnt and it actually came out of my hair really easily phew! The powder also came out of my clothing too, so i’m glad i will be able to wear the dress again as i actually really like it! Overall I had such a great day as did Laura. I think it was the perfect event to attend for my first ever festival as it gave me a taster of what a longer one could be like. I think i would have to get over the idea of not having a shower, a mirror and not being able to wash my hands properly first, then i might consider it! 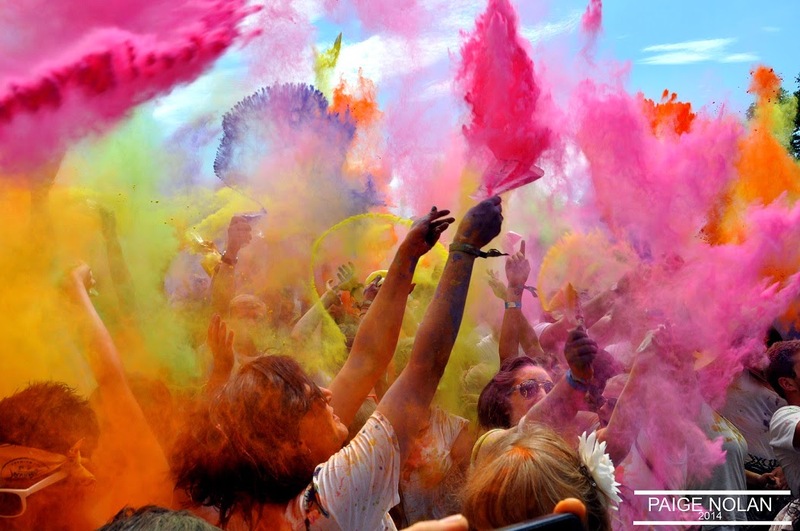 Would you go to a HOLI ONE festival? Have you been before? Do you like festivals? Are you going to any festivals this summer?